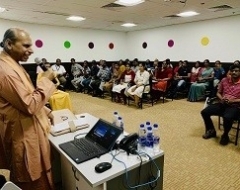 Yogoda Satsanga Society of India, Chennai Kendra in association with IVTL Infoview Technologies conducted a Talk on Meditation – The Key to Success by Swami Suddananda Giri at the office premises of IVTL in Karapakkam, Chennai. 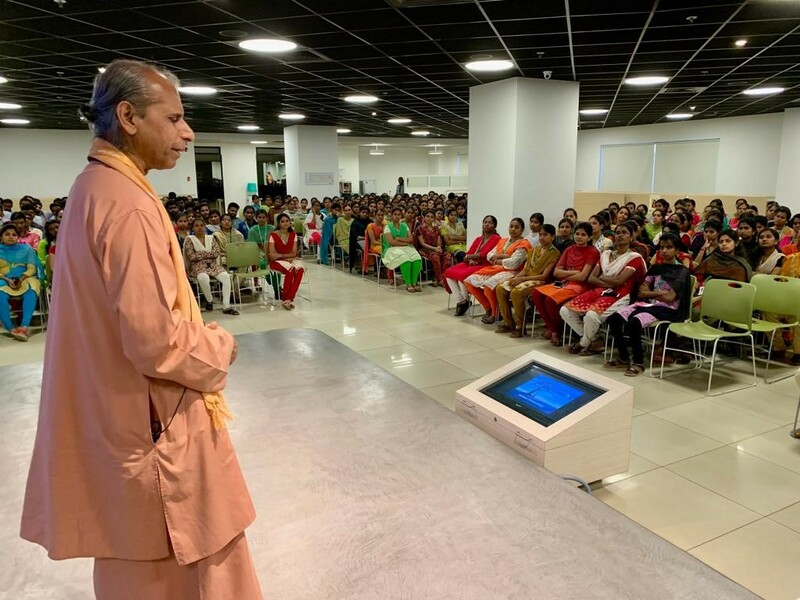 The event was attended by the CEO of Infoview and a live audience of over 500 employees, with another 1700 employees connecting online from two other locations in India. Swami Suddananda Giri addressed the audience on how to achieve all round success and lead a balanced life through Yoga. Drawing from management bestsellers like Gungo Ho and The Corporate Mystic, Swami ji interestingly explained how modern management experts are now arriving at the same conclusions that spiritual masters from our land discovered and taught since time immemorial. That true success is measured by what we achieve within, in our interiority, rather than mere outer materialistic achievement of wealth, fame or prestige. Swami ji quoted a relevant verse from the Bhagavad Gita where Lord Krishna stresses on the importance of observing moderation in everything that leads to Yoga or divine union. True success can be achieved only with all around self-development, and balance between the spiritual and the material is indispensable. He shared Sri Paramahansa Yogananda’s curriculum for all round self-development that includes body care, mental engineering, Social arts and applied spiritual science and shared intuitive quotes from the Autobiograhy of a Yogi to illustrate Sri Yogananda’s teachings. The highlight of the evening was a Meditation break! Swami ji led the over 2000 audience with simple energization techniques, pranayama and visualization and shared 10 practical tips from Sri Yogananda’s curriculum on How to Free yourself from Tension. The audience got a feel of how a simple 10 minute practice such as this meditation break during their work day can refresh and revitalize them. The talk was well received by the enthusiastic youngsters most of whom were in the age group 21 – 27. Towards the end of the talk, the audience was taken through a live demo of the YSS website and the procedure to enroll for the latest edition of lessons and become a YSS member. A free copy of the eBook (in 5 languages) and the recently released Audiobook (Tamil) of Autobiography of a Yogi was made available to all.